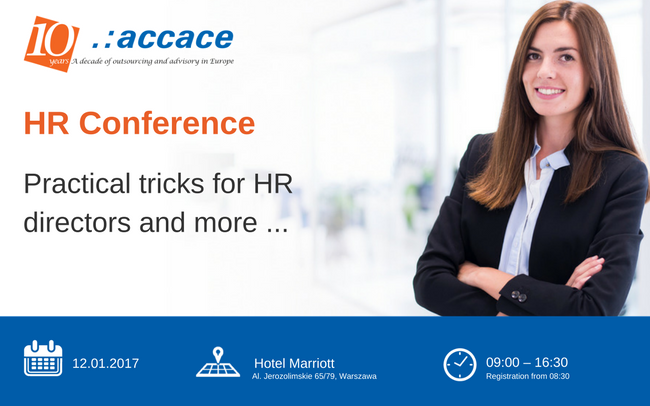 The next edition of the HR Conference organized by Accace in Poland will take place on January 12th. At the event we particularly invite HR executives, directors and HR consultants, employers, team leaders, HR and payroll specialists, trainers, recruiters, coaches, mentors and HR business partners. The Accace conference is aimed at entrepreneurs who want constantly improve their knowledge of HR management. We are convinced that both the subject matter and the form of communication will be interesting for you, but most important, useful in your daily work.